But Maj. Paolo De Angelis, head of the Vatican fire department, told the Italian news agency ANSA April 16 that the structural differences between Notre Dame and the basilica and, especially, the differences in the materials used, make a catastrophic fire at St. Peter’s less likely. While the attic of Notre Dame was known as “the forest” because of the lattice of oak beams supporting the roof, in St. Peter’s, he said, most of the supports are in stone or masonry. The few wood beams, he said, are covered in a fire-resistant varnish and are constantly monitored by an ultramodern fire alarm system. 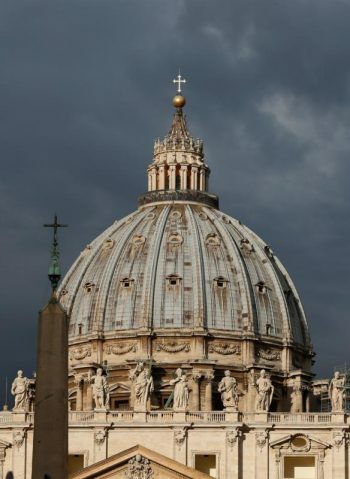 One area of particular concern is the Apostolic Palace, which houses the papal apartments that Pope Francis does not use, but also the papal library and formal meeting rooms and part of the Vatican Museums. According to the “Attivita della Santa Sede,” a volume containing the annual reports of every Vatican office, the firefighters inspect the building’s large attic in person every afternoon. The Vatican fire department has three dozen firefighters, providing round-the-clock protection to the people and buildings in Vatican City State. Most of their work consists in a constant series of appointed rounds to inspect the buildings and fire extinguishers, hoses and hydrants. But the firefighters also have had advanced training in flying drones to inspect those hard-to-reach places. They do get regular emergency calls, especially to free people from blocked elevators and to pump water out of basements and other low-lying areas after a rain. The “Attivita della Santa Sede 2015,” the last volume published, said only three fires were reported throughout the Vatican, its offices and apartments that year. In almost every interview De Angelis has given over the past five years, he has described the most challenging and physically demanding calls as being those to rescue people suffering from a panic attack or a suspected heart attack while attempting to climb the 551 steps from the basilica floor to the top of the dome. In 2015, firefighters were called 21 times to help someone on the steep, narrow and winding staircase.